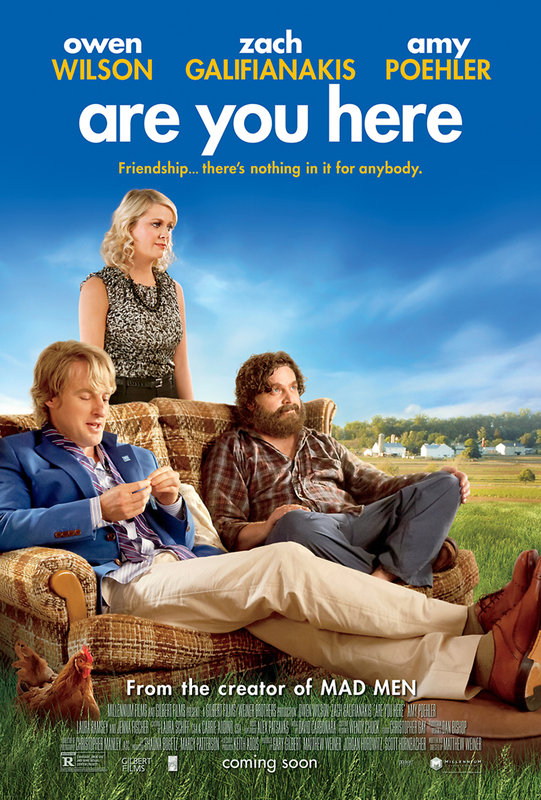 Are You Here DVD and Blu-ray release date was set for September 30, 2014. Steve Dallas is a weatherman who works in Annapolis, Maryland. He spends his days and nights talking about the weather and trying to find easy thrills in drugs and trysts with many women. This distracts him and prevents him from establishing solid connections with others. Steve has a sole friend in Ben Baker, who is wacky and suffers from bipolar disorder. Ben resides in a trailer and leads an isolated lifestyle. When Ben finds out that his father passed away, he asks Steve to come with him back to his Amish hometown in Pennsylvania. Once Ben arrives back home after a road trip with Steve, he finds out that he's the primary heir to his father's money. Steve, in the meantime, has his eye on Laura, the young stepmother of one of his pals.